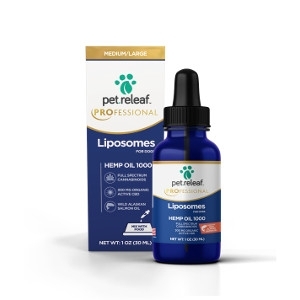 Pet Releaf Liposome Hemp Oil 1000 includes an Organic Full Spectrum Hemp Oil extracted using a super critical CO2 extraction method. This product is perfect for medium to large breed dogs that require the use of food to take supplements. It has no known contraindications (won’t interfere with other medications) and no known negative side effects. Pet Releaf Professional Liposome Hemp Oil 1000 is an innovative technology that allows our Organic Full Spectrum Hemp Oil to be administered directly on your pet’s food. Beyond convenient administration, it is 3x more bioavailable than our standard CBD hemp oils when administered on food, giving pet parents 3x more usage out of a single bottle. It is intended for those dogs and cats that need a higher potency product and requires the use of food to take supplements. 100% of Pet Releaf hemp is grown at the largest Certified USDA Organic hemp farm in the United States. Pet Releaf planted a specialized strain, PR-33, grown specifically with pets in mind. Since Pet Releaf uses the entire plant (seeds and stalks), Pet Releaf Liposome Hemp Oil provides all the benefits of CBD while also providing a multitude of additional benefits provided by the terpenes and flavonoids.